Srinagar: Over a period of time the Indian agrarian economy is faced with great crisis and same has been coming to light by reporting of farmer suicides as widely reported in the Indian and international media. This crisis has been attributed to growing burden of credit on farming community and their inability of making repayment as a result of constant crop failures. The political class of India has been demanding farm loan waivers from Banks the quantum of which has been envisaged between 70000 crores to 256000 crores Since the RBI has already opposed such a step observing that such steps are going to vitiate the honest culture of repayment of Bank loans. On the other hand the votaries of loan waivers have been arguing biased approach of RBI by maintaining silence on write offs, and offer of haircuts to corporate India in their defaulted loans availed from banks. Most of the blame is now being diverted to the banks demonizing them as cruel moneylenders of colonial India. But this diversion seems totally misdirected as most of the suicide victims had availed the credit from non banking channels on exorbitant interest rates, thus proving failure of their reach to Indian banking. However such propaganda is initiated only to misdirect the attention of masses from real issues concerning farming community and divert the public ire against the banks branding them as exploitive tools of corporate backed selected political leadership. Indian economy is mostly dependent on agriculture and more than 80% of population is directly or indirectly dependent for its livelihood hence the market for industrial manufactured products. It was in this background that the developmental route India will come through development of agricultural sector helping to create a demand for products of manufacturing sector of industry. India had inherited model of British Banking which continued to work in tandem during the decade of fifties and sixties. It was in late sixties when the GOI observed that this model of banking was not delivering the desired impetus to the growth and developmental agenda of the welfare state of India hence came with its own policy framework for a reformed British model. This started with taking over ownership and regulatory role for the banking industry in 1969 by nationalization of Banks. The basic agenda of this policy shift was to regulate flow of banking credit to desired sectors. During the period of seventies and eighties the improvement in flow of bank credit to agricultural sector from 2% to 38% not only sufficed the investment requirement of the sector but also increased employability in it helping to improve the economic position of farmers increasing their purchasing power. Policy shift by announcement of new economic policy in 1984 and implementation of banking reforms the GOI in 1991 started moving away from the basics of regulating the banking industry. This was beginning of trying to find imported solution for indigenous problem which is continuing till date and is affected Banking sector now. However, the experts with GOI is continuing to turn blind eye to the phenomenon of falling share of banking credit to agriculture and rising share of bank credit to personal and housing sectors. After more set of reforms were implemented as corrective measures by GOI in 1998 following review of failure of reforms in south East Asian countries resulting in food riots in these countries. In India the corrective action was initiated by then NDA Govt in 2001 followed by the successive UPA Govt in 2004 by announcing doubling of flow of agricultural credit in next 3 years. This was first acknowledgement of the political leadership of commission of errors in understanding needs of farm sector in India. During the period since 1990 the economic policies of GOI allowed the development of personal and real estate sector beyond desired level enabling these sectors attracting considerable share of total bank credit for creation of dead assets in economy on the cost of agriculture sector. Post 2001 the increased figure of agricultural credit scrutiny reveals that it is inclusive of trade credit availed by traders and companies dealing in agricultural inputs. This was made possible by redefining the agricultural credit to present a rosy picture. However the truth remains that this sector still remains to be a neglected sector of economy since 1990 onwards and GOI has not made any serious effort to work in the direction to allow farming to remain an attractive profession. 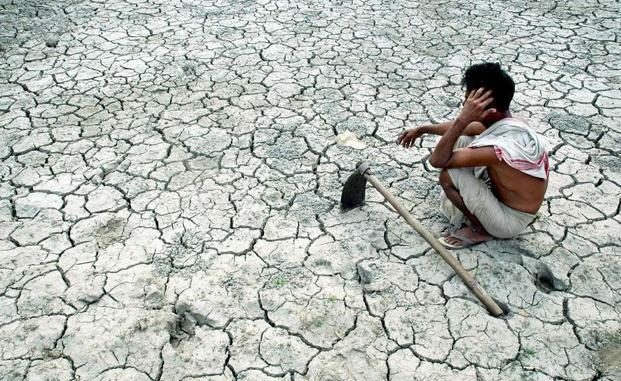 The present woes of agrarian distress is a result of having no vision for agriculture sector which is mostly dependent on farming and its failure is affecting other sectors including the banking. Hence the solution is that the capitalistic corporate backed political establishment of GOI needs to understand that the demand for the industrial manufacturing sector has to come from rural India which can be generated by increasing the purchasing power of rural population where farming remains the main activity of employment. Once this dream is realized the wheels of economic cycle will start moving helping the banks to recover their dues.